I canâ€™t remember seeing any pandas in a zoo, although Iâ€™m sure I have.Â One of the zoos I visit even has a panda in their logo, so there have to be some of them around there somewhere.Â Nonetheless, they are a very cute animal, even if they can be ferocious at times out in the wild.Â Now thereâ€™s a new movie out about a panda that might not quite be ferocious, but he can get down and dirty when he needs to. 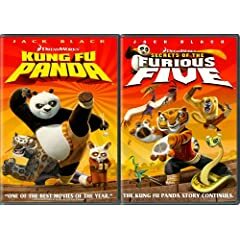 Starting this November 9th, now available on DVD from DreamWorks Animation Home Entertainment comes the sequel to the story of everyoneâ€™s favorite panda who knows some kung fu.Â Secrets Of The Furious Five is ready to burst out of your television screen and whoop you into a state of pure enjoyment.Â Bring home this great additional adventure today! Po has defeated the evil Tai Lung, but an even greater adventure is ready to begin.Â Po is now trying to teach a whole class of unruly animals the secrets of kung fu, yet the kids are refusing to listen.Â In order to show them that kung fu is more than kicks and punches, Po tells them stories of when he and the Furious Five, consisting of Tigress, Viper, Monkey, Crane and Mantis, had to go on another great adventure.Â He teaches the kids and those of us who are watching at the same time. This DVD is completely loaded down with special features.Â You can learn how to draw all of the main characters, a great dumpling shuffle game, a pandemonium activity kit bursting with great things to do, a chance to learn the panda dance, a deeper look at the Chinese zodiac, a featurette about the animals in this film, an exploration of what fighting style you just might be and so much more. This is a great follow-up to the first movie.Â It is actually being released at the same time as a bonus film included with the first DVD and itâ€™s completely worth it to pay a little more to get the both of them together.Â The animation isnâ€™t quite as crisp in some places, but the story is a great one.Â Again, itâ€™s not so much of a sequel as more of a parallel adventure with the DVD release.Â Itâ€™s a good one and I recommend picking this up at the same time as the original. Youâ€™ll love learning these Secrets. No user commented in " Movie Review: Secrets Of The Furious Five "